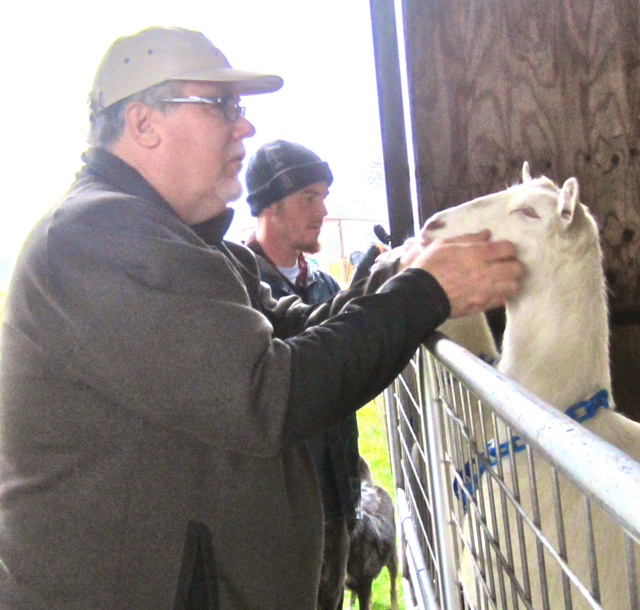 McKINLEYVILLE – The goats are good to go, even hot to trot, at Cypress Grove Chevre’s (CGC) new dairy on Dow’s Prairie Road in McKinleyville. There, the randy ruminants which compose the beginning of CGC’s permanent herd are making whoopee, with the first batch of kids anticipated in June. Bob McCall and Ryan Andrus commune with one of their fuzzy charges. “We’re going to have one of the genetically best herds in America,” says Bob McCall, CGC sales and marketing director. 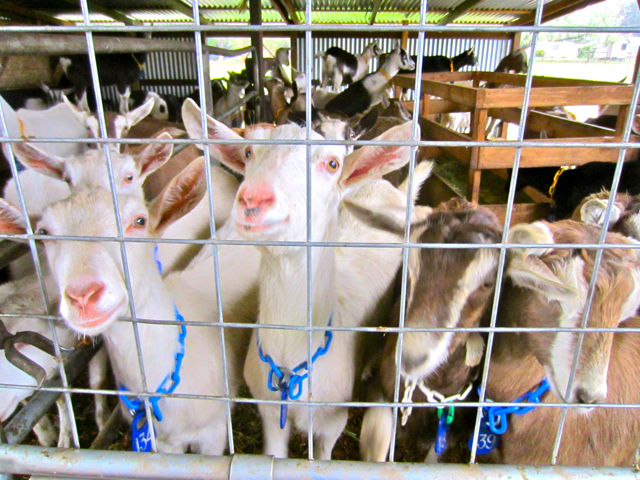 Each of the 195 “starter” goats was hand-picked for their high pedigrees. CGC undertook creation of its own dairy for several reasons. Among them, to meet booming demand for its premium cheese, and in the longer term, to help grow Humboldt’s goat scene by implementing its vision of a modern dairy that is both artisinal in quality and industrial in scale. CGC walked away from its original plan for a multimillion-dollar goat dairy in Arcata after neighbors of the Arcata Bottom site, known as the Gilardoni Property, reacted with a combination of scare rhetoric about goat waste killing children and physically menacing company employees. This boy made himself irresistible to the girl-goats with liberal use of urine-cologne, gaining a tousled hairdo that looks as though it was styled that way. The bling helps too. The harsh rebuke of a proposal that the company had offered to shape in consultation with the neighbors – despite no public process being required due to its siting on land already zoned for agriculture – triggered a blowback of anguish at the missed opportunity by many who supported the dairy. It also gave fresh momentum to establishment of an open-space greenbelt around Arcata, one in which this sort of ag activity would be banned. 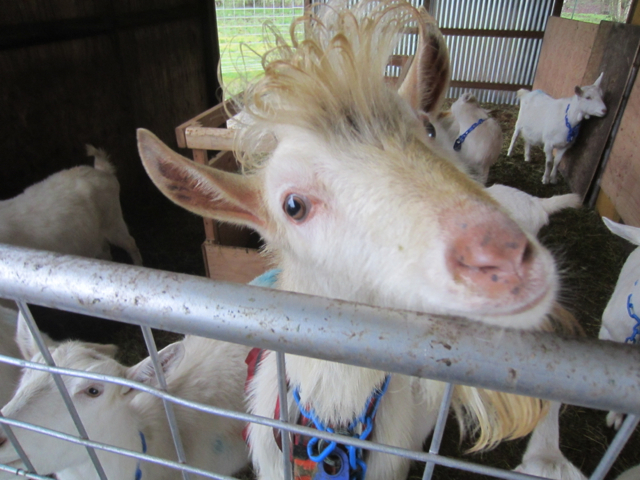 All that seems like a distant bad dream now, as 15 miles north of the ever-hyperpoliticized Arcata rhetoric, new hoop barns rise on the company’s tranquil, 37-acre Dow’s Prairie dairy while goats frolic in their pens. Parent company EMMI, he said, is bankrolling the new dairy and expansion of the Arcata manufacturing plant at an estimated $8.5 to $9 million, while leaving decisionmaking to local CGC management. 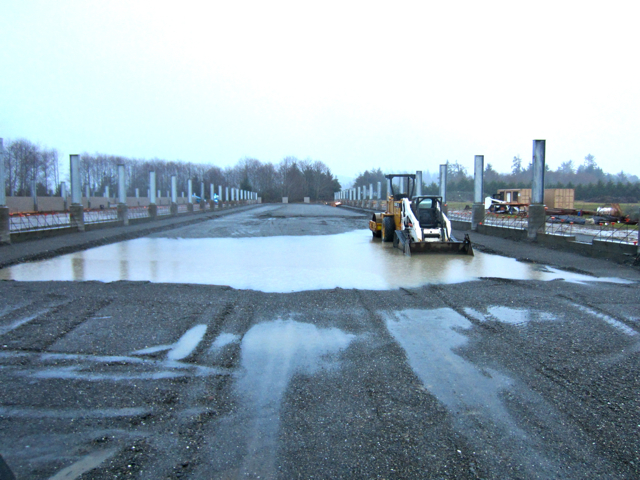 The rising foundation for one of the three expansive, open-ended barns. Overseeing the new herd and dairy is Ryan Andrus, who managed a dairy in San Mateo County for five years before moving to Humboldt to take on the CGC project. Having studied environmental science and chemistry, Andrus is eager to help mature the enterprise, especially given the high-quality tools he’s been given to work with. Even to the untrained eye, the handsome animals suggest quality breeding, with sleek coats, bright eyes and perky demeanor. They jostle and bah for attention, perching eagerly on fence rails to get a good view of visitors. The excited bleating ceases as they eagerly accept nuzzles, eyes closing in bliss while receiving a hearty neck scritch, not hesitating to sneak a curious nibble on a coat cuff. Three breeds mingle in the pens, each chosen for the distinctive qualities of the milk: Saanen, which offer high volume and long lactation; Toggenburgs, whose milk has higher milk fat; and Alpines, said to offer the most consistent quality. “It’s all for the cheese,” McCall says. The herd’s eventual size is not set, as CGC is determined to develop it in holistic fashion, using best practices and maturing the facility as needs require. The initial idea is to roughly double the herd every year. For now, the 190 does, four bucks and lone hermaphrodite dwell in the sturdy but ramshackle former horse pens, but evidence of a modernized future is all around. Structural parts for the three hoop barns are stacked along the muddy fields. Their stubby foundations suggest their grand scale and modernity. Each will be 365 feet long and 65 feet wide, with vinyl roofing offering natural light. Open ends will offer the goats constant access to a pasture. A milking parlor and other support facilities are also planned. A dilapidated farmhouse which had been infested with powder post beetles is being rebuilt with $100,000 in improvements. In Dow’s Prairie, neighbors take care of neighbors. Some have come over to offer Andrus and his wife warm greetings and housewarming gifts like fruit and baked goods. And then there are the less-cordial Arcata neighbors, some still with an axe to grind. The dairy’s product will be processed at CGC’s Arcata manufacturing plant, which will have to be expanded to accommodate the volume. The company will need Planning Commission approval, preceded by discussions with several of the City’s citizen advisory committees. That could mean a reprise of some of last June’s controversy, as one of the louder Arcata dairy opponents from last June has already turned up with a critique of what turned out to be an old, discarded expansion plan dating back to 2002. That’s why CGC is glad to have an orderly public process based on hard data and fact-finding rather than the kinds of assumptions and misinformation that ruled the discussion last year. For McCall, the proof is in the doing, and his most pressing concern now is to create a model facility in McKinleyville – one consistent with CGC’s international reputation for a top-tier product. When construction is complete and settled into an operational groove, the company plans to open it up for scheduled tours and open houses. This entry was posted on Tuesday, January 31st, 2012 at 10:22 am	and is filed under News, Community, Animals, Business, Environment. You can follow any responses to this entry through the RSS 2.0 feed.